"Hmm, are you planning on going head to head with my tactics?" Based on Napóleon Bonaparte, who was a French military and political leader who rose to prominence during the French Revolution and its associated wars. As Napoleon I, he was Emperor of the French from 1804 until 1814, and again in 1815. The leader of the European Union, rounding out all of the other quirky heroes. 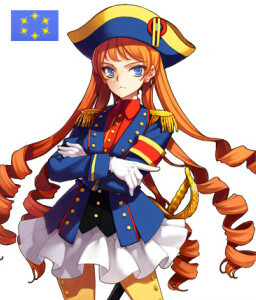 Napoleon is a brilliant general in regards to her decisiveness and leadership, but overbearing nature puts a smudge on her otherwise perfect character. Perhaps due to overly strong sense of responsibility, she finds it difficult to be honest with herself. She gets worked up easily, and will sacrifice herself to defend her people and comrades. In a nutshell, Napoleon is a really hard worker.